Missouri voters will decide in November whether a the state Constitution should allow a photo ID to be required to vote in Missouri. 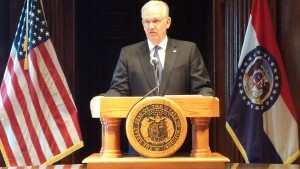 It was up to Governor Jay Nixon (D) whether the voter photo ID constitutional amendment would go before voters in the August Primary or the November General Election, after the legislature voted to put that question before them. Nixon has decided it will go before voters in November. The legislature passed a bill that would require voters to show a photo ID to cast a ballot, or to sign a document swearing they don’t have one at all – in which case the state would pay to provide them one, and they would still get to vote. That bill, or any other photo ID proposal, could not become law, though, unless the state Constitution is changed to say such a requirement is allowed. That’s because the state Supreme Court ruled in 2006 an earlier voter photo ID law was unconstitutional. Nixon said he wanted to put the question up in an election in which the most voters were likely to participate, and thereby have a say on the issue. Nixon opposes the idea of a photo ID requirement, but statute required him to decide on which ballot to place the question. Meanwhile, it’s still up to him whether to veto the photo ID bill, sign it, or let it become law without his action. Republican backers say a photo ID requirement will help fight voter fraud and ensure the integrity of elections and each vote cast. They express confidence voters will pass the amendment. Democrats say the requirement will disenfranchise many voters, and is unnecessary.